USB hub is a simple accessory especially useful tor machines with few ports available. It surprises me when I need to get a new one to replace my old Belkin hub, there is not many options from known brands available in the market. Most of the brands that I know are now busy promoting their new USB-C hub, leaving behind the conventional full-sized USB connector. Makes me wonder, when did I get this far behind? Or do I? My work laptop has 2 USB ports (normal full-sized USB) and I regularly need to plug in 3 to 5 cables. It is an old Lenovo laptop and I do not have the option to request for an upgrade. Whether I like it or not, USB hub is something I have to use on regular basis. 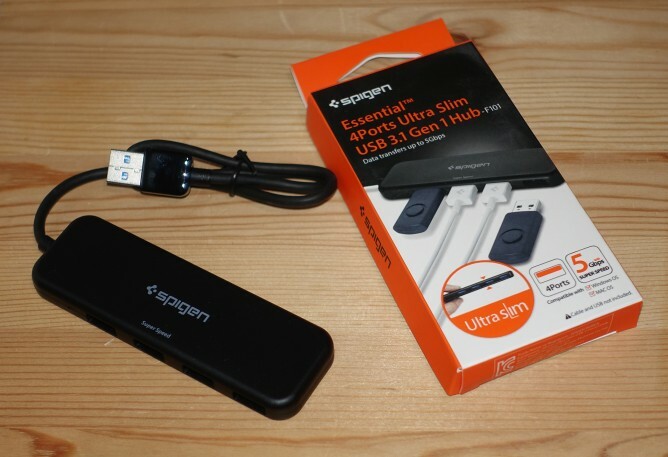 After a bit of searching, I settled with this Spigen Essential 4Ports Ultra Slim USB 3.1 Gen 1 Hub. That is an awfully long name for a simple and straightforward product, but I don’t need to remember its name after I finish writing this article. It is a simple USB hub. It has 4 ports, all USB 3.1 with traditional full-sized connectors. The 20 cm cable is fixed to the hub (cannot be detached) but it feels sturdy enough and hopefully will survive everyday use for a long time. I like the fact that this thing is quite thin and lightweight. I regularly plugged 2 wireless receiver (for keyboard and for communicator headset) and so far they are sufficiently powered. This product does what it is supposed to, and I have no complain. Good purchase and I will keep on using it.